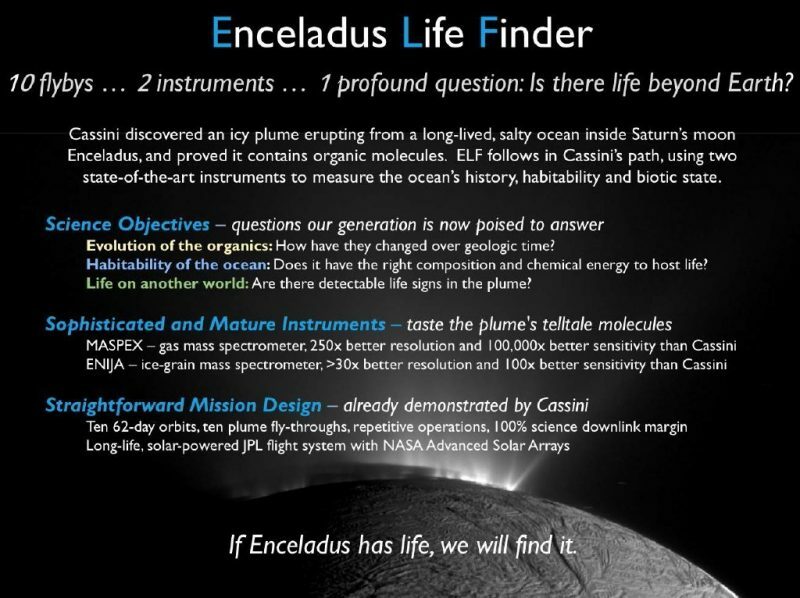 A privately funded team may beat NASA to the punch when it comes to looking for life on the Saturn moon Enceladus. NASA’s Saturn-orbiting Cassini spacecraft discovered the plume, and the 100-odd geysers that create it, in 2005. 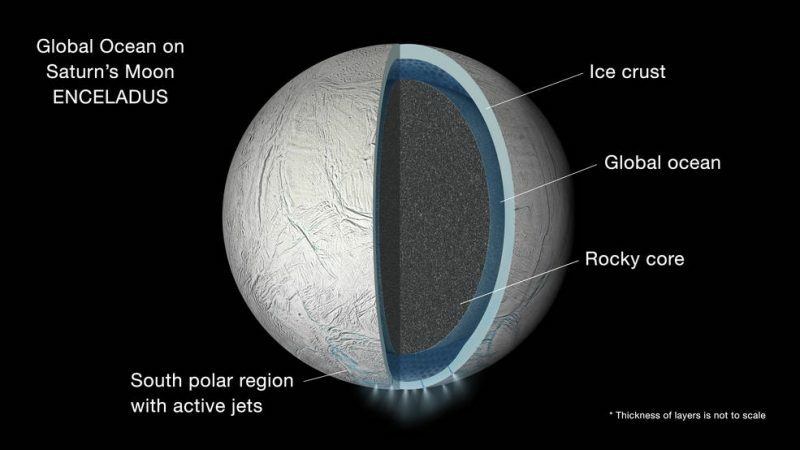 Subsequent observations by the probe revealed that these geysers are blasting stuff out from a potentially habitable ocean of salty liquid water that sloshes beneath the 313-mile-wide (504 kilometers) moon’s icy shell. When Greg Matloff’s “Solar Sail Starships: Clipper Ships of the Galaxy” appeared in JBIS in 1981, the science fictional treatments of interstellar sails I had been reading suddenly took on scientific plausibility. Later, I would read Robert Forward’s work, and realize that an interstellar community was growing in space agencies, universities and the pages of journals. Since those days, Matloff’s contributions to the field have kept coming at a prodigious rate, with valuable papers and books exploring not only how we might reach the stars but what we can do in our own Solar System to ensure a bright future for humanity. In today’s essay, Greg looks at interstellar propulsion candidates and ponders the context provided by Breakthrough Starshot, which envisions small sailcraft moving at 20 percent of the speed of light, bound for Proxima Centauri. What can we learn from the effort, and what alternatives should we consider as we ponder the conundrum of interstellar propulsion? Marc Millis, Paul Gilster and their associates of the Tau Zero Foundation are to be congratulated on the recent award of a $500,000 NASA grant to investigate the prospects for a near-term interstellar probe. As one of the co-authors of The Starlight Handbook, the author of Deep-Space Probes and many interstellar related papers, a former NASA consultant in this field and an Advisor to Project Starshot, I would like to offer some gentle and very personal suggestions about how to best spend this money. Since it is unlikely that I can attend this year’s Tennessee Valley Interstellar Workshop, I have elected to submit these concepts to Centauri Dreams. The basic reason for an early interstellar endeavor is knowledge acquisition. Data acquired by a star-probe en route to its destination includes in situ measurements of the interstellar medium including ions, neutral atoms, dust grains and cosmic rays. Of particular interest to designers of eventual human-carrying star arks is measurements of the directionality of high-Z cosmic rays. If these originate from discrete sources in and beyond our galaxy rather than being omni-directional, the problem of shielding a space ark will be more readily solved. Another possible function of such a probe is extra-galactic astrometry. If the probe carries a telescope, the very-long baseline observations possible when pairing with solar-system instruments during interstellar cruise should yield valuable data regarding distances and kinematics of extra-galactic objects. During the interstellar transfer after the probe’s distance from the Sun exceeds 550 AU, the Sun’s Gravitational Focus can be applied to obtain greatly amplified images of astrophysical objects occulted by the Sun. Trajectory deviations farther along the probe’s interstellar track might indicate the presence of elusive dark matter. Upon arrival in the destination planetary system, investigation of planets within the target star’s habitable zone will be the highest priority. Does life evolve on any water-rich world within the liquid-water temperature range, if that world has an atmosphere? Or are special conditions such as a massive satellite a requisite? If living planets are commonplace, do technology and civilization naturally evolve? Because we have received no unambiguous signals from hypothetical advanced extraterrestrial civilizations and intelligent ETs are apparently rare or non-existent in our solar system, our early interstellar robots should be configured to investigate the “Eerie Silence” (as Paul Davies has dubbed it) and Fermi’s Paradox (“where is everybody?”). Do advanced ETs perhaps evolve in a non-technological direction, or do they generally self-destruct? Or do they generally elect to remain radio silent and not engage in interstellar exploration and colonization? I will next consider the probable destination for a probe that we might conceivably launch in the 2050-2100 time frame. Our early probes should almost certainly be directed towards the nearest stars—the Proxima/Alpha Centauri triple star system. This system, which is estimated to be about 6 billion years old, consists of two central Sun-like stars (Alpha A and Alpha B) and a red dwarf companion (Proxima). Alpha A and B orbit their common center of mass in an elliptical orbit with a period of about 80 years. At their closest (periapsis), Alpha A and Alpha B are separated by about 9 Astronomical Units. At their farthest (apoapsis), their separation is in excess of 30 AU. Each of the central Centauri suns could have planets orbiting within their habitable zones. Alpha A/B Centauri is about 4.27 light years from the Sun. Proxima Centauri is a bit closer at 4.24 light years from the Sun. It is quite possible (but not definite) that this star is gravitationally bound to the Alpha A/B even though its current separation from Alpha A/B is about 15,000 Astronomical Units.. During the summer of 2016, the discovery of a planet with a probable mass 30% greater than Earth orbiting Proxima Centauri within that star’s habitable zone was announced. A less-than-poetic designation for this planet is Proxima b Centauri. Although several research teams are investigating the possibility of habitable worlds attending Alpha A or Alpha B Centauri, the discovery of Proxima b was totally unexpected. Since the nearest star to the Sun has a probable planet orbiting within its habitable zone, it is reasonable to conclude that such worlds are very common in our galaxy. Our early extrasolar probes— Pioneer 10/11, Voyager 1/2, and New Horizons— don’t really count as starships. Yes, they have left or will eventually leave our solar system and move freely through the Milky Way galaxy. But their propulsion systems—chemical rockets combined with giant-planet gravity assists are not effective enough for true star voyaging. Even the fastest of these would require about 70,000 years to reach Proxima/Alpha Centauri if it happened to be pointing in the right direction (which it isn’t). A human colony ship, often called an interstellar ark or world ship, could probably be designed using near-term technology such that it could survive a millennial journey to our nearest stellar neighbor. But such a long travel time for a robotic probe would be difficult to sell to the scientific community since most research participants would prefer to see some results within their lifetimes. So the Breakthrough Initiatives project Breakthrough Starshot pushes technology to its limits on numerous fronts in order to design a starcraft capable of traversing the enormous distance between the Sun and Proxima/Alpha Centauri in about 20 years. Everything about Starshot is enormously challenging. A hyperthin sail with dimensions up to a few meters on a side must be generated. Image: Artist’s concept of the Breakthrough Starshot sail under beamed acceleration. Credit: Breakthrough Initiatives. It must have near perfect reflectivity, high emissivity, low areal mass thickness and very high melting point. This is necessary for it to survive a several minute exposure to a 50-100 GW laser beam without melting. By the way, it must also have enormous tensile strength in order to support the nano-payload during the acceleration process. The sail must also be configured to maintain stability within the beam. The laser array would likely be mounted atop a Southern Hemisphere mountain, in order to point at Alpha Centauri. Adaptive optics must be used not only to compensate for the effects of Earth’s atmosphere but to insure that the beam completely fills the sail during the acceleration process at distances measured in millions of kilometers. Also, since a single continuous wave 50-100 GW laser is somewhat beyond current capabilities, thousands of smaller lasers must be synced together to produce the beam. Assuming that the sail survives the acceleration process, it must possess ample on-board intelligence to perform several tasks independent of Mission Control. First, it should reorient itself to travel edge-on rather than broadside through interstellar space. This is necessary to reduce the effects of dust grain impacts. Although interstellar dust is rare in our galactic vicinity, even a single grain moving at 0.2c (60,000 kilometers per second) relative to the sail has an enormous wallop. But we’re not done yet. Approaching Proxima/Alpha Centauri, the sail must reorient itself once again to allow its instrument suite to survey the environment of the destination stars and to send the results towards Earth. A very tall order indeed for a ~gram-massed nano payload. None of the above challenges present physical impossibilities. The question is whether they can all be achieved in a single nano-spacecraft within the next few decades. So any NASA-funded interstellar initiative intended for possible implementation within the next few decades should not attempt to duplicate the goals of Project Starshot. Rather than a 20-year travel duration, a 100-year flight time might be more realizable in the near term. Mission planners need to realize that even this is quite a challenge. A 100-200 year travel duration might be a reasonable goal. Many propulsion systems have been proposed to enable interstellar exploration and colonization. Only a few have any hope of being feasible in the near term. Before we get to the near-term possibilities, it might be nice to review some of the more exotic suggestions. It would indeed be lovely if one of these devices emerged from the realms of science fiction and Hollywood special effects into the real world. Then we could wander the star lanes with the same dispatch that we book a flight to Europe. Unfortunately, all of these short-cuts through space-time require either enormous amounts of energy, exotic forms of matter or new physics. It seems wise to continue research in these possibilities. There is no telling when or if a breakthrough might occur. But it would be unwise to hold our collective breaths. In the 1960’s, we were treated to the famous Dean Drive. Now engineers in several international locations are testing the Shawyer EM Drive. These and similar devices apparently violate one of the basic laws of classical mechanics: Conservation of Linear Momentum. Although excess unidirectional thrust seems to be generated by the EM Drive, Marc Millis has described in this blog numerous possible causes for this effect that do not violate this law. Before any proposed thrust machine can be seriously considered for application to interplanetary or interstellar propulsion, it must demonstrate excess thrust in outer space conditions. Two venues for preliminary in-space tests are stratospheric balloons and sub-orbital rockets. If these succeed, a follow-on demonstration would be a dedicated cubesat containing the device deployed in Low Earth Orbit. This physically possible interstellar propulsion system utilizes total conversion of matter to energy in the reaction between matter and antimatter. Sadly, we are a very long way from the capability of creating the necessary mass of antimatter in a reasonable time frame. If we applied humanity’s best antimatter factory (the Large Hadron Collider) to the the task of full-time antimatter production, we might have a gram of the stuff after 100 million years. Another problem is storing the antimatter. Charged sub-atomic particles can be stored in Penning Traps for periods of weeks. These devices use crossed electric and magnetic fields to contain the particles. If applied in space travel, how would the trap’s fields compensate for variable spacecraft acceleration? Also, might stray cosmic rays heat and divert the anti-ions so that they explosively interact with the walls of the containment vessel? Perhaps it’s a good thing that application matter-antimatter technology does not seem a near-term possibility. Our security would be jeopardized enormously (and probably terminally) if terrorists could smuggle city-killing weapons in thimble-sized containers. By far the most elegant of physically possible interstellar spacecraft is Robert Bussard’s fusion ramjet. This craft utilizes an electromagnetic (EM) scoop to collect interstellar hydrogen over a large area and redirect the plasma to a proton-proton fusion reactor. Energized fusion products (helium nuclei) are exhausted out the rear of the craft. An ideal ramjet, accelerating at 1g could reach near-optic velocities in about a year Earth time. Because of relativistic effects, the craft could cross the galaxy within the crew’s lifetime, according to on-board clocks. Sadly, there are a few problems with the proton-fusing ramjet. First and most significant is the difficulty of igniting the proton-proton thermonuclear reaction. This reaction, which powers main sequence stars such as our Sun, is many orders of magnitude more difficult to ignite than the fusion reactions we currently experiment with. One way around this is to consider lower performance ramjet alternatives such as the ram-augmented interstellar rocket (RAIR) that carries on-board fusion fuel and uses scooped protons as additional reaction mass. But even that approach is limited by the limitations of EM scoops that have been suggested to date. Most (including those considered by this author) function better as proton reflectors or drag sails—very good for interstellar deceleration but not too effective for achieving high velocities. The one exception to this is Brice Cassenti’s toroidal scoop, suggested in the late 1990’s. But because this scoop utilizes an array of superconducting wires projected in front of the spacecraft, only accelerations of the order 0.01 g are possible. In the near future, the best we can likely hope for to apply ramjet technology is in-space experiments using electric and magnetic sails to reflect the solar wind. This might encourage the perfection of both an interplanetary propulsion option requiring no on-board fuel and experimental tests of an approach to interstellar deceleration. 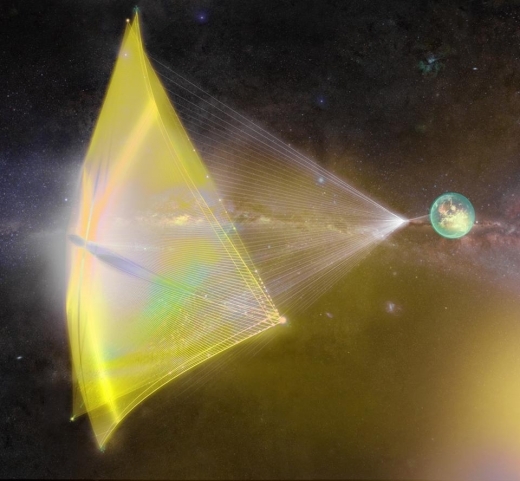 It is unclear whether Project Starshot’s imaginative enterprise will be successful. Even if a beam projector is located on a high mountain, it is not known how rapidly it can be adjusted to compensate for atmospheric turbulence. Another unknown is whether the beam-steering mechanism will be efficient enough to keep the beam output directed at Alpha/Proxima Centauri for several minutes. Finally, much analysis is required to insure that the beam is centered on the sail and fills the sail during the acceleration process. Any funded consideration of interstellar probes would be wise, however, to investigate terrestrial and in-space experiments to demonstrate the utility of beamed propulsion. These could be far less ambitious and expensive than the Project Starshot concepts. For example, imagine two cubesats launched simultaneously into Low Earth Orbit. One contains a wafer sail. Its neighbor deploys a very low-power laser or maser projector. The beam is focused on the unfurled sail. It should be possible to monitor both sail acceleration and stability in the beam. Another possibility is to repeat an experiment originally planned for the failed Planetary Society Cosmos-1 Earth-orbiting solar-photon sail. After the sail is unfurled, a microwave beam from a terrestrial radio telescope could be focused on the sail. 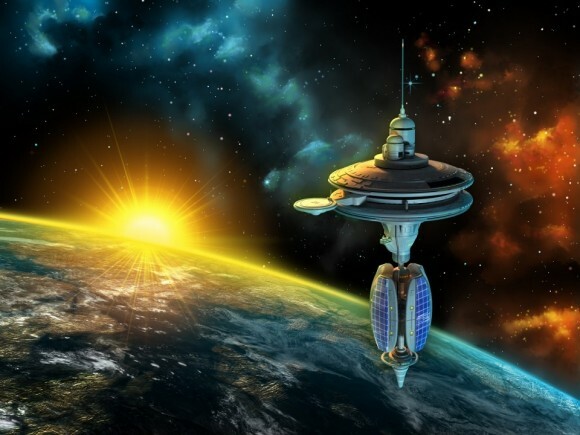 If sail stability and acceleration can be demonstrated, this will advance the possibility of Earth-escape by low-orbit photon sails as well as furthering the cause of interstellar travel. Theoretical researchers might also expand the concept of particle-beam propulsion. Because electrically charged sub-atomic particles carry significantly more linear momentum than photons, it would be interesting to develop an understanding of particle-beam collimation over interplanetary and interstellar distances. But there is a geopolitical obstacle to the construction of a ~gigawatt laser-, maser-, or particle-beam projector in space. Such a device could be applied to accelerating a starship or diverting an Earth-threatening asteroid; it could also be construed as a weapon. If such an enormous beam projector could be constructed in space and could maintain its aim for decades, a hybrid interstellar propulsion system might ultimately become feasible. This is the laser ramjet. In such a vehicle, interstellar ions collected by a Cassenti EM scoop could be accelerated by energy beamed from the solar system. Nuclear fission has been an available energy source for more than 70 years. The solar-electric rocket (or ion drive) has been used successfully on several interplanetary probes. 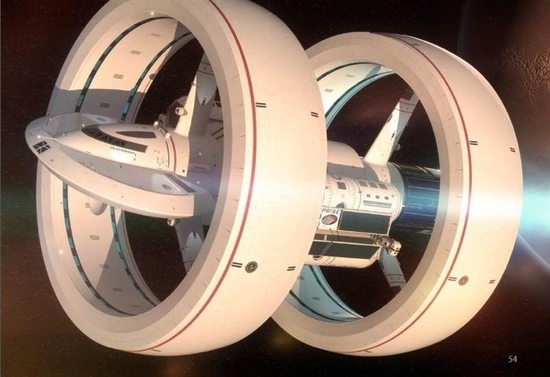 One reasonable approach to interstellar travel is to remove the solar panels and connect the ion drive’s thruster to a nuclear-fission reactor. In such a device, the reactor energy output would ionize propellant atoms (or molecules) and accelerate the resulting ions out the rear of the spacecraft. There are at least three factors limiting interstellar application of fission-electric propulsion. One is propellant availability. To reduce thruster erosion, the inert gas xenon is used as propellant in most current solar-electric drives. Applying this approach to the much more massive fuel requirement of an interstellar probe would likely far exceed the annual terrestrial production rate of xenon. Alternative propellants should be investigated. Then there is the matter of geopolitics. Many citizens of our planet would be somewhat unnerved if one of the major space powers began to store the large amount of fissionable material required in Low Earth Orbit during construction of the massive probe. One way around this is to construct the probe as an international project, similar to that applied to creation and operation of the International Space Station. Technology is another limitation. Present day ion thrusters are limited to exhaust velocities of about 100 kilometers per second. So a nuclear-electric rocket launched using current technology might require 10,000 years to reach Alpha/Proxima Centauri. Exhaust velocity must be raised to at least 1000 kilometers/second to propel a “1000-year ark”, as discussed by Les Shepherd in his 1952-vintage JBIS paper on interstellar travel. To reduce probe flight time to 100 years or so, the ion-exhaust velocity must be increased by another order of magnitude. Another required improvement to implement ion-propelled interstellar travel is the reduction of the propulsion system’s specific mass (kilograms/kilowatts). As my late friend, the UK propulsion expert Dr. David Fearn once told me, such a reduction is challenging but ultimately not impossible. There are two major types of fusion under development. Magnetic fusion, which confines the reacting plasma in EM fields, seems to always be a few decades in the future. Some have quipped that it is the energy source and the propulsion system of the future and always will be. Small scale inertial fusion confines and compresses micropellets using crossed electron or laser beams. Large scale inertial fusion—the hydrogen bomb—accomplishes confinement and heating reactants using fission charges, and has of course been operational for more than 60 years. Large scale inertial-fusion propulsion was first investigated during the early space age by NASA and the US Department of Defense in the original Project Orion. The first demonstration in a scientific journal of the near-term feasibility of large-scale interstellar travel was Freeman Dyson’s original paper on an interstellar Orion in the October 1968 issue of Physics Today. Assuming propulsion by exploding hydrogen bombs, Dyson demonstrated that the US and USSR Cold War nuclear arsenals were sufficient to dispatch thousands of migrants on colonization ships. The estimated duration of one-way voyages to Alpha/Proxima Centauri was 130-1,300 years. In an ideal world, the former Cold War adversaries would be glad to donate their now-obsolete thermonuclear arsenals to the worthy cause of promoting an interstellar diaspora. Sadly, we do not live in such a world. Even if nuclear “devices” would be donated to the worthy cause of interstellar exploration/colonization, there are a few technical difficulties to contend with. Unless we can master aneutronic fusion reactions such as the boron-proton scheme, it must be demonstrated that spacecraft structures can survive periodic high-energy thermal-neutron doses. Application of fusion micro pellets also has a number of technical issues. First, there is the problem of fuel availability. To reduce neutron irradiation on ship structures, the Daedalus study of the British Interplanetary Society (BIS) considered a Deuterium-Helium3 fusion fuel cycle. The problem is that Helium3 is very rare on Earth. To construct a Daedalus craft, cosmic helium sources must be tapped—perhaps the lunar regolith, atmospheres of giant planets or the solar wind. The BIS follow-up to Daedalus, called Icarus, uses a Deuterium-Tritium fuel cycle. Here, it might be necessary to breed Tritium in nuclear fission reactors. Some engineering issues must be addressed before Daedalus/Icarus-type pulsed fusion ships can become operational. What are the acoustic effects of repeated fusion ignitions within the reaction chamber? Will the walls of the reaction chamber be damaged if laser- or electron-beams miss a fuel pellet? Another significant issue is the enormous size of inertial fusion ships. Even if payload mass can be drastically reduced, the beam projectors, reaction chamber and associated gear are massive. One suggestion to reduce the mass of an inertial-fusion propelled spacecraft is worthy of future study. That is Johndale Solem’s Medusa concept. In Medusa, the massive reaction chamber is replaced by a hyper-thin, high-melting-point, radiation-tolerant sail. Fusion charges are ignited within this flexible canopy, which is connected to the payload by strong cables. 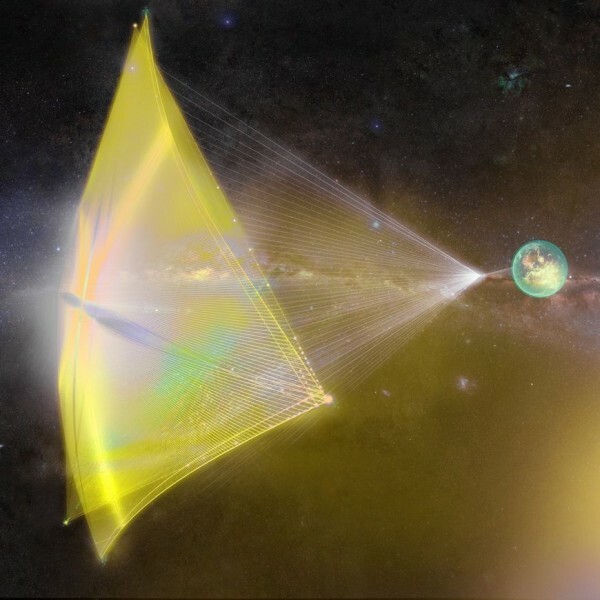 There are several reasons why photon sails have emerged as the near-term interstellar propulsion system of choice. First, small photon sails have been unfurled and operated in Earth orbit and interplanetary space. Second, the photon sail can be scaled with the payload. A payload-on-a-chip requires a small sail. If the payload is small enough, sail and payload can be deployed from a small cubesat. Sail deployment and integration with payload can therefore be based upon current operational experience. But today’s multi-layer solar-photon sails are not really capable of interstellar travel. Even if sail acceleration is combined with giant-planet gravity assists, it seems clear that Alpha/Proxima Centauri travel times less than 10,000 years will be difficult to achieve. The best we can expect from current solar-photon sails is exploration of the heliopause at around 550 AU, the Sun’s gravity focus at >550 AU, and the inner reaches of the Sun’s Oort Comet Cloud. In all likelihood, interstellar probes launched by solar-photon sails will never be as fast as those launched by laser-photon or maser-photon sails. The reason for this is that solar irradiance is an inverse square phenomenon—acceleration at Jupiter is 1/25 that at Earth’s solar orbit. A collimated and accurately aimed beam could maintain sail acceleration over much greater distances. But the advantage of solar-photon over beam-photon sails is that mission designers need not concern themselves with the beam-projection system. The solar constant should not vary too much for the foreseeable future. So a number of researchers have evaluated the possibility of all-metal sails, dielectric sails, carbon nanotube sails and mesh sails. But the ultimate sail material might be a molecular monolayer such as graphene. Graphene is a hyper-strong layer of carbon, one molecule thick. Its melting point is in excess of 4,000 K and it is impermeable to many gases. In the visible spectral range, graphene is essentially transparent. Its fractional visible absorption is 0.023. As I describe in a 2012 JBIS paper, combination with other materials can increase reflectivity to about 0.05 and absorption to ~0.4. Graphene sails carrying robotic payloads and unfurled near the Sun seem capable of reaching Alpha/Proxima Centauri in a few centuries. Because human-carrying arks are limited to ~3g accelerations, these larger ships require about 1,000 years to reach these stars if they are propelled by graphene sails. But here is where Project Starshot can play a very major role. In order to reach ~0.2c in a ~50 GW laser beam without melting, the sail reflectivity to laser light must be very high. Perhaps this can be achieved with an appropriate mesh-like meta material. Or perhaps the reflectivity of molecular monolayers such as graphene can be greatly increased. After the Project Starshot workshop last August, participants produced draft Requests For Proposals (RFPs). I have discussed the possibility of increasing graphene reflectivity with theoretical condensed-matter researchers at my home institution (CUNY). It is quite possible that they will submit a proposal in response to the RFP when it is issued. If monolayer reflectivity can be greatly increased, it will be necessary to demonstrate that this action does not adversely affect monolayer tensile strength so that the wafer sail is strong enough to support the payload during a very close solar approach. It will also be necessary to demonstrate that sail and payload can survive the very hostile environment encountered near the Sun. A solar-photon sail will likely never achieve the ~0.2c interstellar velocity of the laser-boosted Project Starshot sail. But, just possibly, solar-photon-sail terminal velocities capable of making the journey to Alpha/Proxima Centauri in a century or so may not be totally infeasible. Tags: Astronomy ( 7,556 ), Astrophysics ( 4,691 ), Basic Research ( 10,450 ), Breakthrough Initiatives, Cosmology ( 4,882 ), EarthSky ( 82 ), How long to travel to Alpha Centauri? Artist’s concept via Breakthrough Starshot. Outer space is big. Really, really, really big. And that’s why NASA has no plans at present to send a spacecraft to any of the several thousand known planets beyond our solar system. Meanwhile, with respect to star travel, NASA isn’t the only game in town anymore. In April 2016, Russian high-tech billionaire Yuri Milner announced a new and ambitious initiative called Breakthrough Starshot, which intends to pour $100 million into proof-of-concept studies for an entirely new technology for star travel, aimed at unmanned space flight at 20% of light speed, with the goal of reaching the Alpha Centauri system – and, presumably, its newly discovered planet Proxima b – within 20 years. Is it possible? No one knows yet, but Alpha Centauri is an obvious target. It’s the nearest star system to our sun at 4.3 light-years away. That’s about 25 trillion miles (40 trillion km) away from Earth – nearly 300,000 times the distance from the Earth to the sun. Follow the links below to learn more about why star travel is so formidable, and about how we might accomplish it. Why won’t a conventional rocket work? These 4 conventional spacecraft are headed out of the solar system. A 5th spacecraft, New Horizons, will also eventually leave the solar system. But conventional spacecraft move slowly in contrast to the vast distances between stars. It’ll be tens of thousands of years before one of these craft encounters a star. Image via Wikimedia Commons. Why won’t a conventional rocket work? Consider the Space Shuttles, which traveled only a few hundred kilometers above Earth’s surface, into Earth orbit. If Earth were the size of a sand grain, this distance would be about the width of a hair in contrast to a 6-mile (10-km) distance to Alpha Centauri. The Space Shuttles weren’t starships, but we have built starships. Five craft from Earth are currently on their way out of the solar system, headed into interstellar space. They are the two Pioneer spacecraft, the two Voyager spacecraft, and the New Horizons spacecraft. All are moving extremely slowly relative to the speed needed to travel among the stars. So … consider the two Voyagers – Voyager 1 and Voyager 2 – launched in 1977. Neither Voyagers is aimed toward Alpha Centauri, but if one of them were – assuming it maintained its current rate of speed – it would requires take tens of thousands of years to this next-nearest star. Eventually, the Voyagers will pass other stars. In about 40,000 years, Voyager 1 will drift within 1.6 light-years (9.3 trillion miles) of AC+79 3888, a star in the constellation of Camelopardalis. In some 296,000 years, Voyager 2 will pass 4.3 light-years from Sirius, the brightest star in the sky. Hmm, 4.3 light-years. That’s the distance between us and Alpha Centauri. What about the New Horizons spacecraft, the first spacecraft ever to visit Pluto and its moons. NASA’s New Horizons spacecraft travels at 36,373 miles per hour (58,536 km/h). Launched from Earth in mid-January, 2006, it reached Pluto in mid-July, 2015 … nine-and-a-half years later. If New Horizons were aimed toward the Alpha Centauri system, which it isn’t, it would take this spacecraft about 78,000 years to get there. So conventional rockets won’t work because they are too slow. Illustration via the Anderson Institute. Warp drive? What if we could travel faster than light? Countless sci-fi books and movies are built around the concept, which brings with its challenges to physicists’ understanding of how space and time actually work. Still, a few years ago, Dr. Harold “Sonny” White – who leads NASA’s Advanced Propulsion Team at Johnson Space Center – claimed to have made a discovery which made plausible the idea of faster-than-light travel, via a concept known as the Alcubierre warp drive. This concept is based on ideas put forward by Mexican physicist Miguel Alcubierre in 1994. He suggested that faster-than-light travel might be achieved by distorting spacetime, as shown in the illustration above. Harold “Sonny” White has been working to investigate these ideas further. They are highly speculative, but possibly valid, and involve a solution of the Einstein field equations, specifically how space, time and energy interact. In June of 2014, White unveiled images of what a faster-than-light ship might look like. Artist Mark Rademaker based these designs on White’s theoretical ideas. He said creating them took more than 1,600 hours, and they are very cool. See the 2014 faster-than-light spacecraft designs on this Flickr page. The video below presents Harold White’s talk at the SpaceVision 2013 Space Conference in November, 2013 in Phoenix. He talks about the concepts and progress in warp-drive development over recent decades. In order to form the warp field/bubble, a region of space-time with negative energy density (i.e. repulsing space-time) is necessary. Scientific models predict exotic matter with a negative energy may exist, but it has never been observed. All forms of matter and light have a positive energy density, and create an attractive gravitational field. So faster-than-light travel via the Alcubierre warp drive is highly speculative, to say the least. With current technologies, it’s not possible. However, if it could be accomplished, it would reduce the travel time to Alpha Centauri from thousands of years to just days. 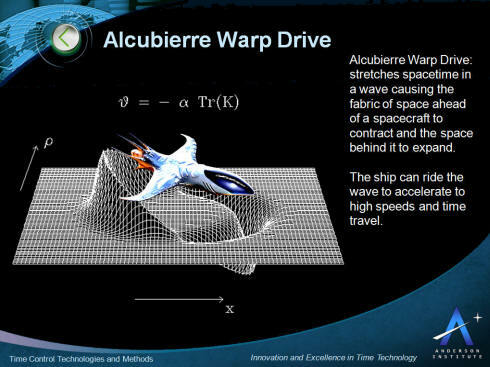 Want technical details on the Alcubierre warp drive? Read this 2014 article at Daily Kos. NASA has a whole area on its website about faster-than-light travel, in which it basically says … it’s not currently possible. Breakthrough Starshot. In April, 2016, Yuri Milner’s organization Breakthrough Initiatives announced a $100 million investment in proof-of concept studies for an all-new way to get to the stars. Well, not all new., exactly. The Breakthrough Starshot project relies on technologies that are being tested now, and also on some new technologies that have been around only a few years. But it does put these technologies together in a way that’s entirely new, and extremely visionary. The Breakthrough Starshot team has some heavy hitters, including physicist Stephen Hawking and Facebook’s Mark Zuckerberg. It proposes to use the $100 million to learn whether it’s possible to use a 100-gigawatt light beam and light sails to propel some 1,000 ultra-lightweight nanocraft to 20% of light speed. If it’s shown to be possible, such a mission could (hypothetically) reach Alpha Centauri within about 20 years of its launch. There are a lot of appealing things about this project. For example, the use of lightsails is currently in the process of being tested by another organization, the Planetary Society, with a publicly funded project called LightSail. But the most appealing thing is that the Breakthrough Starshot project is truly innovative, yet still grounded in current, cutting-edge science and technology. Just realize that all existing spacecraft are huge and clunky in contrast to the gram-scale nanostarships – dubbed StarChips – being proposed by Breakthrough Starshot. Can tiny, light ships – on sails pushed by a light beam – fly 1,000 times faster than the fastest spacecraft built up to now? That’s what Breakthrough Starshot is exploring with its ongoing proof-of-concept studies. Starshot envisions launching a mothership carrying the 1,000 tiny spacecraft to a high-altitude orbit. Each craft is a gram-scale wafer, carrying cameras, photon thrusters, power supply, navigation and communication equipment, and “constituting a fully functional space probe,” the Starshot team has said. The plan is to stick four cameras (two-megapixels each) on the nanocraft, allowing for some elementary imaging. The data would be transmitted back to Earth using a retractable meter-long antenna, or perhaps even using the lightsail to facilitate laser-based communications that could focus a signal back towards Earth. The original idea was to send the spacecraft flying through the Alpha Centauri system without slowing down. After all, how can they slow down? It turns out someone has already figured out a possible way. In early 2017 two scientists announced the results of their study of a possible braking method, using the radiation and gravity of the Alpha Centauri stars themselves. We don’t know yet if such a thing can work, but it’s heartening to see scientists getting involved in this idea! Clearly, the Breakthrough Starshot project is one that’s worth watching. On April 20 and 21, 2017, Breakthrough Initiatives held the second of what it says will be an annual conference – called Breakthrough Discuss – aimed at bringing together leading astronomers, engineers, astrobiologists and astrophysicists. This year, they held the conference at Stanford University and focused it on discoveries of potentially habitable planets in nearby star systems, including Alpha Centauri. Videos related to discussions at the conference are archived on Breakthrough’s Facebook page, if you’re interested. Bottom line: At 4.3 light-years away, the Alpha Centauri system is the nearest star system to our Earth and sun, but getting there would be extremely difficult. This ESOcast Light takes a quick look at the main facts and why this is an important step for the future. Footage and photos: ESO, Breakthrough Initiatives, Gianluca Lombardi (glphoto.it), Nick Risinger (skysurvey.org), B. Tafreshi (twanight.org), S. Brunier and C. Malin (christophmalin.com). 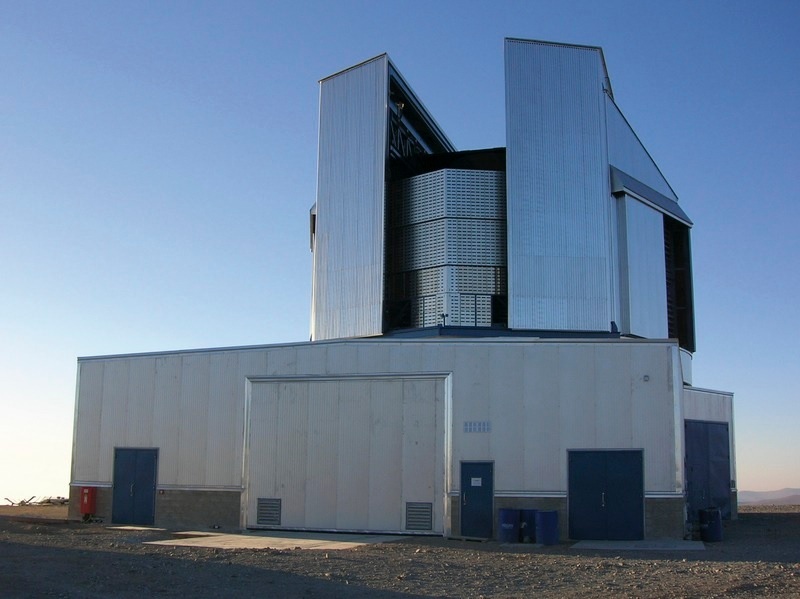 ESO has signed an agreement with the Breakthrough Initiatives to adapt the Very Large Telescope instrumentation in Chile to conduct a search for planets in the nearby star system Alpha Centauri. Such planets could be the targets for an eventual launch of miniature space probes by the Breakthrough Starshot initiative. No image credit. Detecting and studying potentially habitable planets orbiting other stars will be one of the main scientific goals of the upcoming European Extremely Large Telescope (E-ELT). Although the increased size of the E-ELT will be essential to obtaining an image of a planet at larger distances in the Milky Way, the light collecting power of the VLT is just sufficient to image a planet around the nearest star, Alpha Centauri.